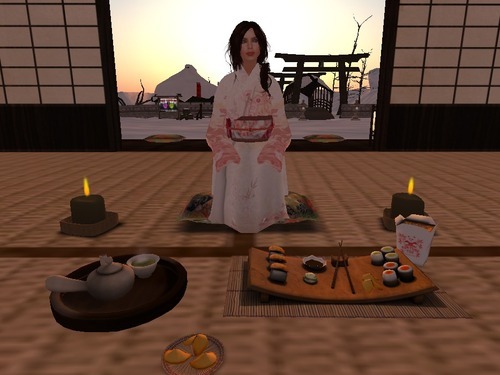 Tomorrow, Tuesday Jan 22 at 7pmSLT I’ll host this discussion on Shintoism. Click here for the SLURL. You may need to IM me for a tp, as the SLURL will take you to the main landing point. Hope to see you all there! Welcome everyone to Sengoku! I want to thank everyone here, and a special thanks out to Cat who made this all happen! Please feel free to leave a donation if you like what you see and want to support the sim growth. Today we are going to discuss the basics of the Shinto religion of Japan. Please feel free to share any comments or questions at any time. Shinto practitioners believe in invisible spirits called “kami,” which are worshiped in shrines or temples called “Jinja.” Kami can also be things that possess power, like mountains and earthquakes. Using the term “spirits” for kami is a simplification. Kami are beings that respond to prayers and can influence the environment or a situation, but aren’t spirits like ghosts as Westerners think of them. They are forces of nature that exist independently as well as in large forces like storms. Everything contains kami. It’s like a yogi saying that energy exists in all of us and in everything. Kami is a property that we all have access to. It is what makes an object itself rather than something else. While everything has kami within it, only those things which show it in a striking way are referred to as kami. We must note that kami are not omnipresent, are not divine, are not inherently different from human or nature, but are a higher manifestation of life energy. Amaterasu, the Sun Goddess, is considered to be a kami. Other Gods are also considered to be kami. The shrines that are used to worship kami can be as large as thousands of acres per shrine, or as small as a few square feet. Rather than Shinto being a belief system of its own, it’s more a system of rituals which can be incorporated into many other religions. For this reason, Shintoism has coincided peacefully with Buddhism, Confusianism, and Animism, among others. Shintoism has no direct belief in a transcendental other world such as heaven, and has no specific God or Gods in which it follows. Shintoism doesn’t have a single scripture, like Christians with the Bible or Buddhism with the sutras. However, you can find written works about Shintoism throughout history. There are, however, symbolic structures and objects practitioners use to go about their rituals. These include torii gates, which are usually located in water, and shimenawa ropes. The practice is not based on commandments or laws that tell one how to behave, but on the will of the kami. Note: Kami are not perfect, and they do make mistakes. Shintoism sees everything as a single unified creation, meaning there is no split between a natural world and a supernatural world, or a body and a spirit. However, it does distinguish between the visible world (kenkai) and the invisible world (yukai); the invisible world being an extension of the visible world. The overall aims of Shinto ethics is to promote harmony and purity in all spheres of life. By saying “purity” we mean not just spiritual purity but moral purity; having a pure and sincere heart. In Shinto ethics there are no moral absolutes; the good or bad of a situation or action is determined based on the context of which it occurs. The followers of Shintoism believe that the world and humans are essentially good, and that evil enters the world through evil spirits which affect human beings in a similar way as disease. Impurity refers to anything which separates us from kami, and from musubi, the creative and harmonizing power. The things that make us impure are called tsumi (pollution or sin). Tsumi can be physical, moral, or spiritual. Impurities can be removed by cleansing or purifying rituals. These rituals can be completed by anyone, and do not require someone like a priest. The concept of purification originates in the legend of the god Izanagi no mikoto, who washed himself free of pollution after visiting his wife in the Land of the Dead. -haraigushi: the use of a wand made from a stick with streamers of white paper or flax fastened to one end. Waived by a priest over the person, place, or object to be purified. -oharae: ritual used on a large group, usually performed in June and Dec in the Imperial Household and other shrines to purify the whole population. Also used after disasters. -shubatsu: sprinkling of salt, used in sumo wrestling to purify the ring, among other things. As you can see, Shintoism is more a single practice, which makes it accessible to anyone, anytime, whether from home, school, work, or in a shrine or temple. It does not require anything of the practitioner, nor does it tell them how to live their lives. The most relevant use of Shintoism in modern days is to ask the kami for a favor, whether its getting a good grade on a test, making your grandmother well, or saving the people from a tsunami. Because of this relaxed use, many Japanese still practice it today, without really knowing that they are. Also, people from all religious backgrounds are able to incorporate it into their daily lives. You can practice it anywhere in the world, at any time. Any questions or comments? I open the floor.